Exide Industries had everything going against it, but it made new friends in rural India. Car sales had plunged, and unbranded batteries had half the replacement market. The industrial sector, a major user of lead-acid batteries, was slipping into a recession. The price of lead, which accounts for 70 per cent of input costs, was going through the roof. Kolkata-based Exide Industries, a leader in lead-acid storage batteries for the automotive and industrial sectors, went flat out to increase sales and cut costs. Exide had no control over sales of cars, but 77 per cent of new cars sold in India come fitted with Exide batteries and need a replacement after two years. 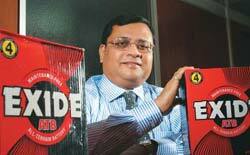 So Exide increased its presence by entering smaller Tier II and Tier III towns. From 30 locations in early 2008, it has over 200 across the country today. These locations are company-owned distribution centres which are points of sale to its dealer network (over 4,000 across the country). These centres also work as warehouse and service points. “Greater focus on replacement market is the result of robust demand in this market on account of strong OEM auto sales in the previous fiscal. Our superior technology and competitive prices gave us huge scope to grow,” says A.K. Mukherjee, CFO & Director (Finance), Exide. At the back end, Exide cut costs by reducing its dependence on lead imports and acquiring two smelters. Exide has ensured that 40 per cent of its lead requirements come from its own sources, against 28 per cent in 2007-08. Savings on raw material costs: 8 per cent. Mukherjee expects the replacement segment to grow at around 20 per cent for the next few quarters. Better still, newcar sales have picked up. “We expect the recent turnaround of the passenger car segment and a robust growth in sales of two-wheelers will contribute to OEM segment growth,” he says. Then, the general power shortage has fuelled demand for back-up devices that depend on batteries. But despite all this activity, Exide preferred to focus on below-the-line publicity activities and product innovation. In the second quarter of 2009-10, Exide reported a 92 per cent increase in net profit to around Rs 150 crore, compared with the same period of the previous year, with big savings coming from lower interest costs.